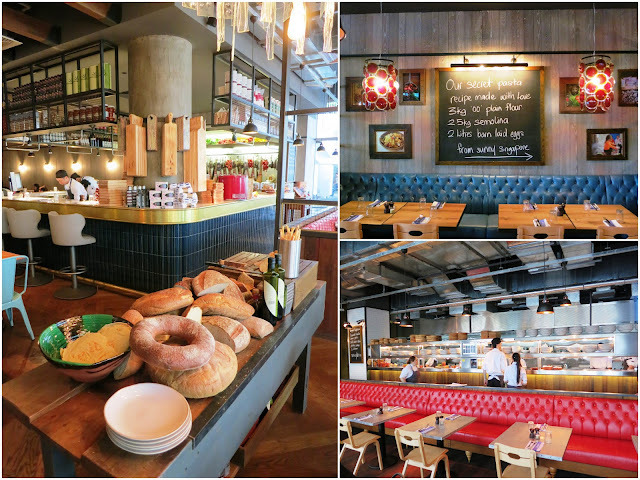 PinkyPiggu: Jamie's Italian Singapore Opens Its Door At VivoCity! Jamie's Italian Singapore Opens Its Door At VivoCity! Jamie Oliver ~ In Singapore! Haha before you get too excited, I'm not referring to the man himself, but Jamie's Italian, his inaugural restaurant in Asia which officially opened its doors at Singapore's VivoCity on July 17, 2013. That's where I'm gonna head to for a taste of the British celebrity chef's take on authentic Italian cuisine. Chef, restaurateur, best-selling author of cookbooks, host of popular TV cooking shows, known for campaigning against the use of processed food in national schools, the naked chef who undo food down to its bare essentials, Jamie Oliver is one dynamic media personality! He may not be here, but people will still come, people will still queue... because it's Jamie Oliver! The name itself is magnetic enough to draw in the crowds which I've heard has been constant since opening day. The only way to escape the queue is to make a reservation online, or come during off peak hours. My first impression as I walked over to my table is that the restaurant is very spacious. The dining area is divided into several sections, all when combined can seat up to 210 people at one time. 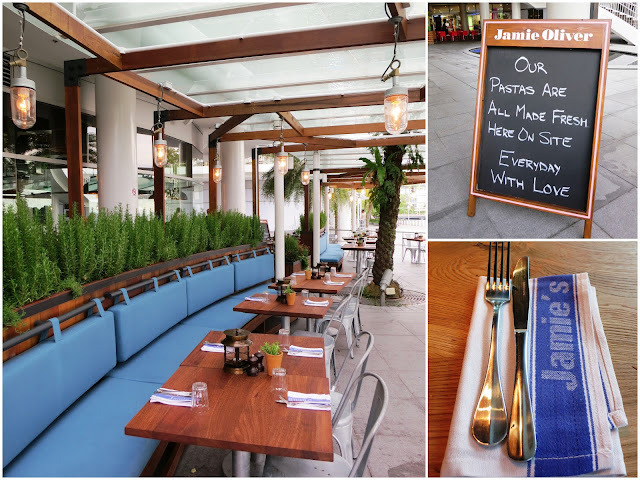 For a beautiful view of the harbour and Jamie's edible garden where they grow their own herbs and spices, do choose to go alfresco. Attention is definitely something which you do not have to seek when dining here. There are numerous staff roaming around to attend to our needs. Be it recommending the signature dishes, taking our orders, refilling water, serving dishes, clearing plates, or checking if we like the food, they did it efficiently, non-intrusively and very much exuberating a warm sincerity which made me feel at ease and welcomed. I simply love the lively energy the place exudes! Headed by Executive Chef Gary Clarke, who is the former Jamie's Italian UK Head of Academy for Senior Chefs, Jamie's Italian cooks up a repertoire of Anti-Pasti, Pasta, Ravioli and Risotto, Mains, Sides, and Desserts. Their pastas are all made freshly on site everyday with love! As one of the signature dish, the Prawn Linguine ($17/$25) was something I wanna try even though I'm not a fan of tomato based pasta. The tanginess of the sauce is just right for me, a level which I enjoyably accepted, but it could do with less oil. The fried garlicky prawns, though nice, is a tad disappointing when it comes to size. I wished it was bigger. The Tagliatelle Bolognese ($15/$22) is a lovely medley of beef and pork ragu, herbs, Chianti and parmesan with crunchy, herby breadcrumbs. The stew of minced meat in red wine is delightfully rich in flavor, complementing the pasta so well with its luscious coat. The firmness of the freshly made pasta is also perfectly done. Love it! 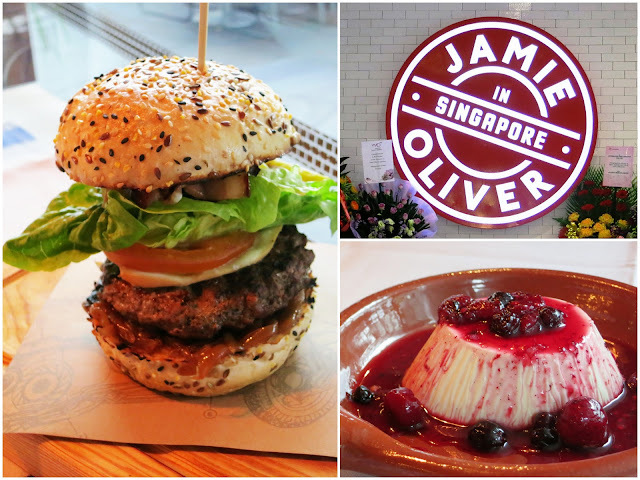 The closest you can have a bite of Jamie is The Jamie's Italian Burger ($27.50), a mini tower of Wagyu steak with smoked mozzarella, pancetta, sticky balsamic onions, tomato, pickles and chillies. The height can be too tall for a gal to hold it well together, take a bite and contain it in the mouth without much of a mess. I always thought to mince up wagyu into a patty is a waste of the premium cut, and even more so when it was too well done here. It rendered me speechless while I gave my jaw a good workout. The smokiness taste was nice initially, until some charred notes were detected. Some parts of the bun and patty were burnt. Oops... Perhaps it needs to be in search of perfection like what Chef Heston Blumenthal did to unlock the inherent perfection in hamburgers. The dessert was the best! I noticed the potential of the Creamy Panna Cotta ($9) which was wobbling as it was placed on the table. True enough, it was so soft, smooth and lovely! The creamy texture is a winner, a heavenly match with delicious fruit compote and berries. This is a must-order! With prices starting at less than $10 for appetizers and most mains at $20plus, it's what we would usually pay at some local cafes. Considering that this is a celebrity chef restaurant, I do find that dining here is comparatively affordable.